Thanksgiving Day beach run. 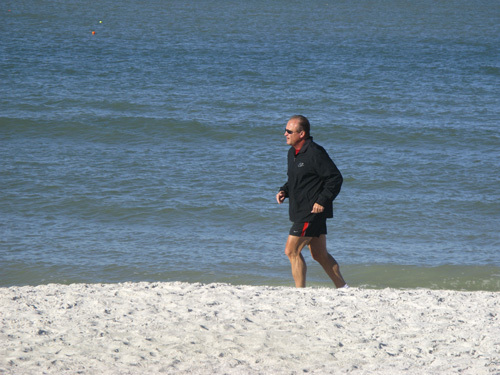 My Thanksgiving beach run, just after sunrise on Treasure Island FL, was cool, clear, uncluttered, and beautiful. As you can see above, this is about as laid-back as you can get for a major holiday morning. 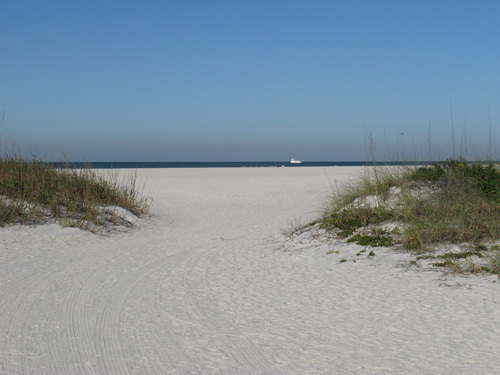 I cannot begin to describe the feeling you get on the Florida beaches when you are one of the first ones out on the sand just after sunrise, on a perfect November morning. It was about 65 degrees, no clouds, no crowds, with just the sounds of waves hitting the shore and seagulls making their presence known. 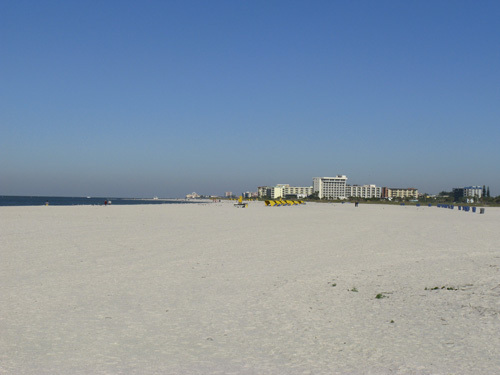 If you are looking for a perfect time for a cheap Florida beach vacation, and you enjoy running or working out on a beach, Treasure Island may be the place you are looking for. 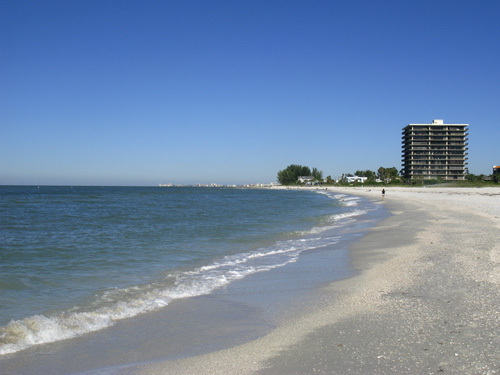 Today, I just chose to run an easy three miles...from the beach at 103rd Avenue, down to Blind Pass Jetty and back. 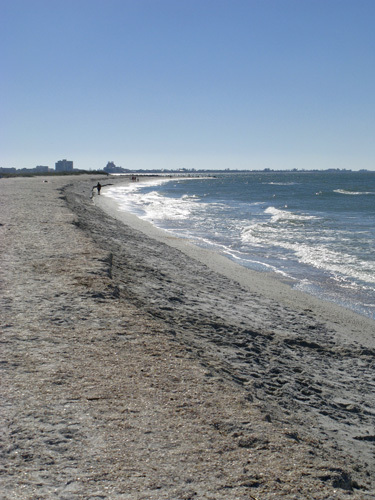 Since it was high-tide, I knew it would make even an easy beach run more challenging. This was just going to be a slow, easy unwinding from the hard workout we had at my CrossFit gym the day before. 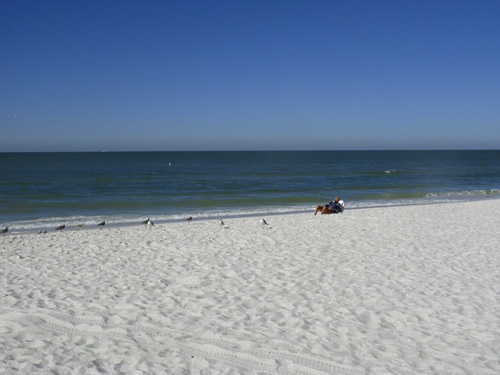 I planned to enjoy the beauty of the Treasure Island beaches, and continually give thanks for the laid-back lifestyle I am able to live here in Paradise. 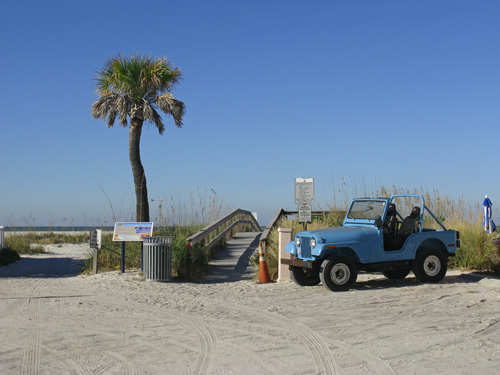 As you can see, my old Jeep was the only vehicle in the free parking lot at 103rd Avenue, off Gulf Blvd. I love the solitude of a beautiful Fall morning. The path down to the shoreline always begins between these two dunes. If I turn right, I'll head north toward John's Pass. If I turn left, I'll run through Sunset Beach down to Blind Pass Jetty. I choose to go left because there are less resorts, and the locals like to sleep in. Right off the bat, I saw another guy out on this laid-back Thanksgiving morning. He was headed south to Blind Pass, just like me. 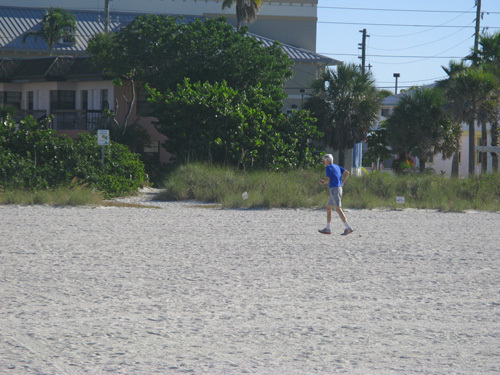 And, way up on the beach, my buddy Mick, was headed back to his condo on Paradise Island. This guy is over 75, and rarely misses a day of running. He must have gotten out here even before sunrise. I hope I can be just as consistent at his age. Retiring on the Florida beaches just keeps you young, I think. 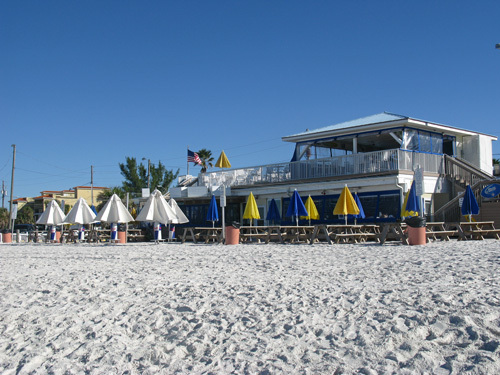 Caddy's Beach Bar was closed for the morning. Normally, at sunrise, the staff is out raking the beach area with a small tractor, setting up the chaise lounge chairs, and the smell of breakfast just draws you to the outside seating. This place is packed everyday in the summer...and Spring Break. 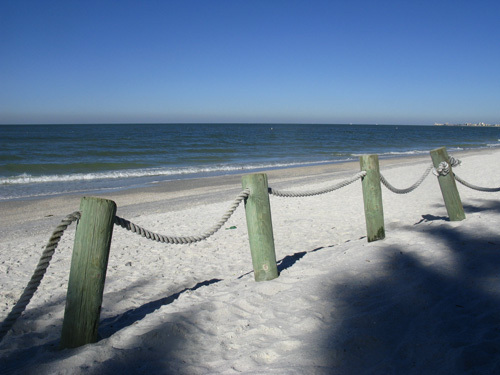 These decorative posts on Caddy's Beach make a nice frame for the Gulf shoreline. I never get tired of the beauty here on the Florida beach. This stretch between Middle Jetty and Blind Pass Jetty, where I turn-around, is the prettiest part of the run. Even when we do interval work on this stretch of Sunset Beach, I still love this portion of the hard work. 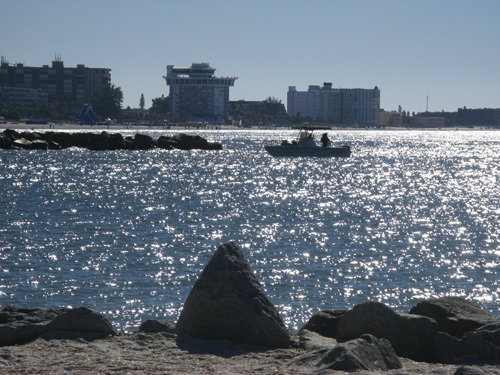 When I got to Blind Pass Jetty, I saw some guys were already out fishing for their Thanksgiving Day meal. What a beautiful setting. It makes it pretty easy to run, here. Heading back toward the start. This is looking from Blind Pass Jetty, back to Middle Jetty. Do I live in Paradise...or what? This guy was one of the few people I saw out here who was not running. Maybe he started before sunrise, and is relaxing while the rest of us finish up. This pretty much personifies the laid back lifestyle of the Florida Gulf Beaches. When I finished, I could not have been more thankful for all the blessing I receive by living the Florida beach lifestyle. My Thanksgiving Day beach run only served to enhance my gratefulness.